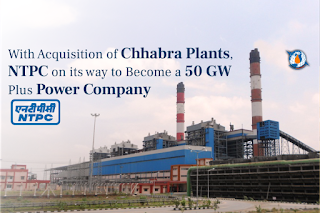 NTPC inks pact to take over Chhabra Thermal Power Plant. A tripatriate Memorandum of Understanding (MoU) was signed between NTPC, Rajasthan Rajya Vidyut Utpadan Nigam Ltd. (RVUN) and Rajasthan Urja Vikas Nigam Ltd. (RUVNL) in the presence of Chief Minister Smt. Vasundhara Raje here at Chief Minister's residence on Wednesday. Directror (Commercial) Shri A. K. Gupta signed MoU from NTPC side while CMD, RVUN Shri N.K. Kothari and MD, RUVNL Shri Bannalal signed MoU from the State Government side. Under the MoU four units of 250-250 MW each of Chhabra Thermal Power Plant will be transfered to NTPC in the first phase while the two units of 660-660 MW each shall be transfered after commissioning. After transfer of Chhabra TPP to NTPC the state government will receive equity as per latest valuation and the losses being incurred from Chhabra will stop after transfer of the plant and debt liabilities of the state government shall also be reduced. By using advanced techology NTPC will get more production with low consumption of coal and the teriff benefit will reach to the consumers of the state. Best practices of NTPC in effciency and system improvement will also be beneficial for other plants of the state. The employees of Chhabra TPP will get the option of merger in NTPC on their will. Energy Minister Shri Pushpendra Singh, Principal Secretary Energy Shri Sanjay Malhotra, Chairman DISCOMS Shri Shreemat Pandey, Joint Secretary in Power Ministery (GoI) Shri A. K. Verma, CMD, NTPC Shri Gurdeep Singh, Advisor Energy Dept. Shri R. G. Gupta were present on this occasion.